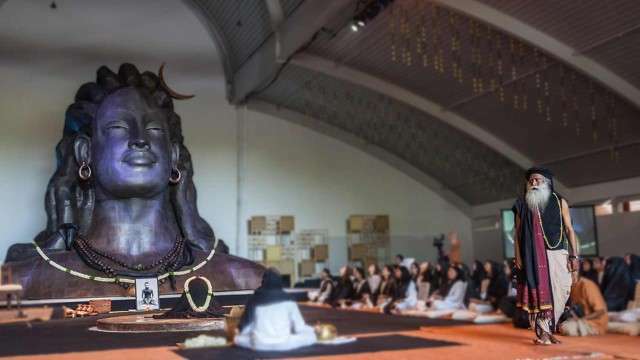 Follow the live blog featuring latest updates from the consecration event of Adiyogi: The Abode of Yoga at Isha Institute of Inner-sciences. Today, on the autumnal equinox, the United States will witness a milestone event in the history of the yogic sciences - the consecration of Adiyogi: The Abode of Yoga at Isha Institute of Inner-sciences. 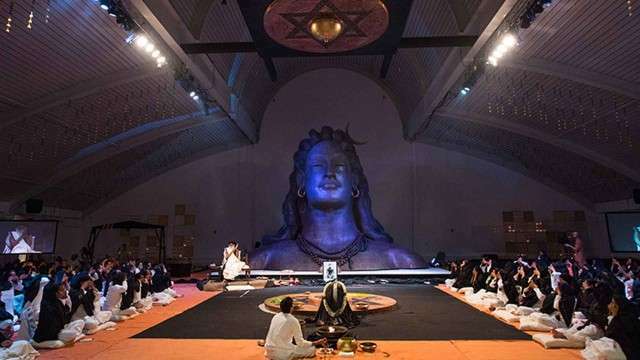 This magnificent 30,000 sq foot structure has been created as a tribute to Adiyogi, the world’s first yogi, who first offered the yogic sciences to humanity. Dedicated to the pursuit and practice of yoga and meditation, The Abode of Yoga will serve as powerful infrastructure to transcend limitations and raise human consciousness in the western hemisphere. Follow the live blog featuring latest updates from the event with Sadhguru, insights into the process of creating this consecrated space, as well as stories from the volunteers who have supported the project along the way. 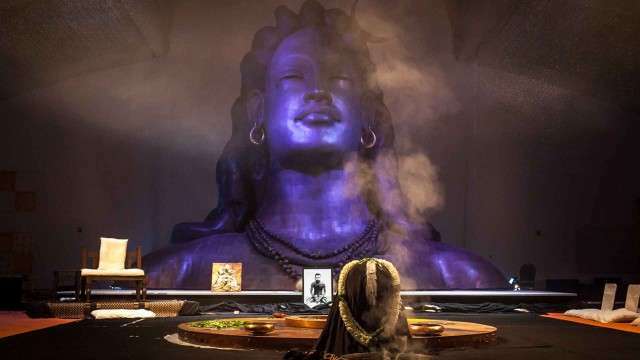 9:00 pm CST: The celebrations for the Adiyogi have been continuing right through the 3-½ hour break. Sounds of Isha kept up the vibrant drums and Yogishwaraya chant in full swing, while participants clapped and danced throughout the venue. Lines formed to offer water to the linga; a celebration to a Divine being whose presence is now amongst us. An announcement is made that a painting by Sadhguru of Adiyogi will be offered for auction at the end of the session. At 9:20 pm CST, Sadhguru enters the hall while the “Adiguruve” chant plays. Sandeep Narayan then sings a beautiful melody in praise of the guru. Sadhguru begins to speak about the profundity of what the Adiyogi will offer. There are many kinds of relationships in the world, Sadhguru says. There are relationships of hate. When I say relationships of hate, he explains, if you hate someone strongly, you will see you will have a constant relationship with them, you cannot avoid them. You can forgive the loved ones, but you can’t forgive the ones you hate. There are relationships of affection, love and admiration, of body, of blood… there are many, he continues. But the essence of being here for these three days is understanding that all of these relationships are just a part of your psychological drama. If we take away one simple aspect of who you are, namely your memory, you will not know whom to hate or love. 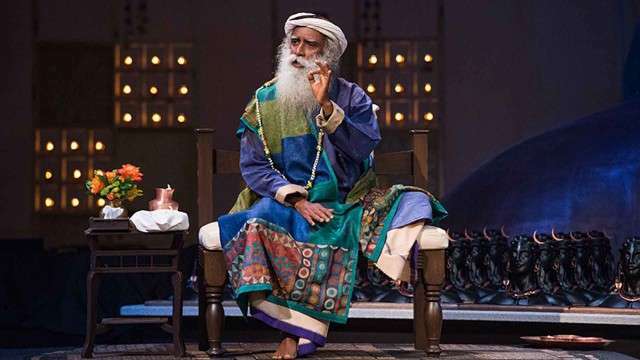 Sadhguru continues by saying that these three days are an effort to form a relationship that is not of blood, body, love or affection, but of life energy - something that you cannot shake off, something that does not need your conscious attention. If you form a bond like this, this relationship will become the guiding light of your life. That, Sadhguru explains, is the reason why I asked you to touch the water with your hand and put it on the linga, so you take up a relationship. You can develop that relationship so that it is always on, whether you are conscious of it or not. Adiyogi has been brought into your life to see that a dimension which has no boundaries becomes a living reality in your life. This relationship, Sadhguru continues, will take away the compulsiveness of action, thought, emotion and energy structures within ourselves. This is a yogi, he says; we call him "Shiva" because it is a boundless possibility. That is why he is referred to as "shi-va", because "that which is not" has no boundaries. This is a possibility that will move you from a compulsive state of logic to the magic of life. "Adiyogi has been brought into your life to see that a dimension which has no boundaries becomes a living reality in your life. If this doesn’t happen in one’s life, there’s nothing wrong, but it’s just too limited." 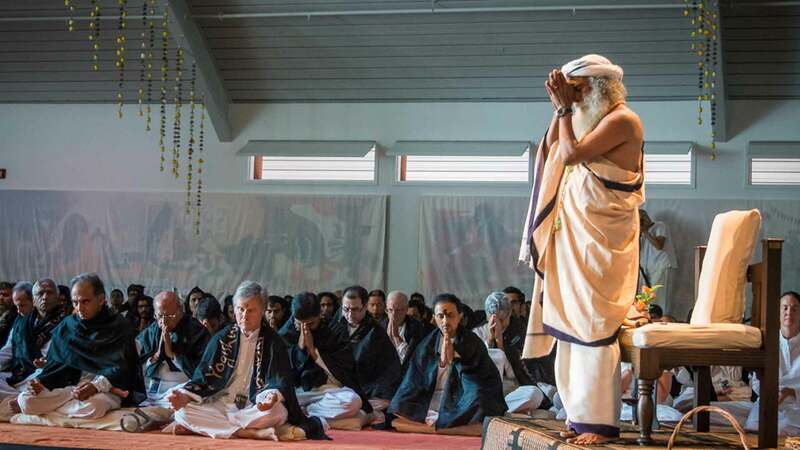 "So Adiyogi is not a three-day process for you. If you allowed him to touch you, he will walk with you, live with you, but don’t start talking to him! That’s one thing you don’t do. Just allow the presence to permeate." A question and answer session takes place after this. Sadhguru talks about his encounter with the Native American man who stood in shame for hundreds of years. He reads the poem “America” and speaks about the Trail of Tears and the pain that those people suffered, which had stayed on the earth. Over the past few years, the energy has changed and now, with this consecration it will never be that way again. After a round of questions, Sadhguru asks Sounds of Isha to play, and the music brings everyone back into the celebratory mode. "Sadhguru offers an arati to Adiyogi, and all join him in chanting Guru Pooja. Sadhguru offers the arati to all those inside and outside of the Abode. Some participants are offered a consecrated statue of the Adiyogi, which they collect at Sadhguru’s feet. It is time for the closing. Sadhguru stands and offers namaskaram in his compassionate way that engulfs every single participant with his grace, and then leaves. We are sad to see the consecration come to a close, with so much love and celebration shared over the past three days. But all carry the seed of possibility of the Adiyogi, and the tremendous sense of offering that the Abode imbibes. His sacred consecration of the Adiyogi: The Abode of Yoga will touch and transform humanity for centuries to come. I bow in gratitude to the tremendous gift of indefinable magnitude made possible by the most magnificent being that ever walked this planet - our Beloved Sadhguru." “I had wanted to spend some time in the India ashram, but now there is clearly an ashram here. Not just an ashram, there’s a consecrated space. The body has a heart. There’s a warmth now, something that you’re drawn to. Just walking to the Abode I felt like I was back in India. The smell of the incense, the clay color of the building, the energy around it, and the artwork that has Sadhguru’s fingerprints. Behind the scenes, many have been involved in volunteering throughout the consecration, ensuring that everything happens in the best possible way. Below, a volunteer involved in the aesthetics aspects of the event shares her experience. "So many people, whether for a short while or longer, put their heart and worked, and the connection was beautiful. For me, the learning experience was very good. I thought I was evolved, and then I see how all those nasty little corners are still there... I love working with flowers because of the vibrance. I feel I can connect to that life. It was one of the first times I got the opportunity to come before the event. I was able to be in that space and connect with so many people. People looked after me, brought me food - I never had to ask for anything, so many people took care of me, and willingly did so many things... It was just everybody coming together, truly wanting to be there. People came for different causes, but ultimately it bonded everybody for one single purpose. I came to volunteer, but then I wanted to be a participant. But as time went on, it didn’t matter to me. I wanted to make sure everything was done. It was ok for me to sit here and get the things done instead of being out there. 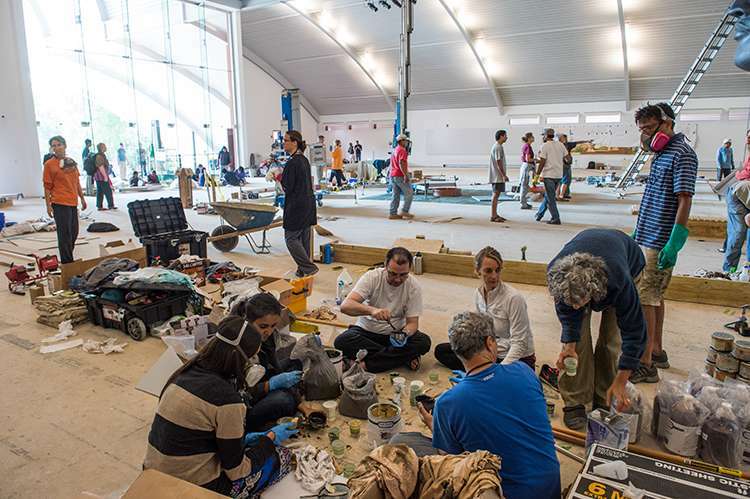 I felt that making sure everything was there was a more joyful experience than sitting and participating. I think that, for me, is evolution. That’s the best evolutionary process that I could get." Sadhguru enters the Abode and is seated. Sounds of Isha begins to sing the tender Kabir ballad “Yugan Yugan Hum Yogi”, and for those moments, the participants are all with Sadhguru. As the song ends, Sadhguru begins to chant the “Yogishwaraya” chant once again, and the participants chant with him. Then the drums join in with force and the chant goes at the highest intensity yet, as Sadhguru’s life-giving clap is heard many times. Sadhguru gets up and begins strolling throughout the venue. 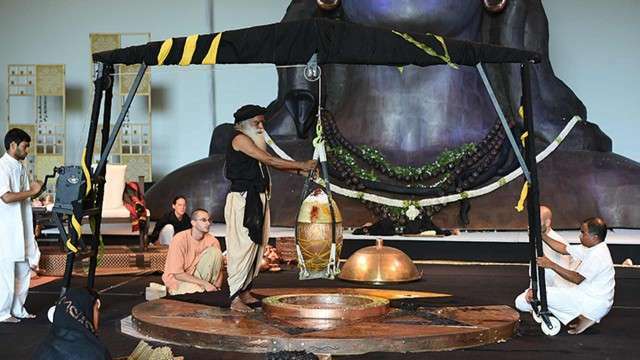 The linga is lifted by gurney while Sounds of Isha plays a consistent drumbeat, and Sadhguru specifies the exact tempo. 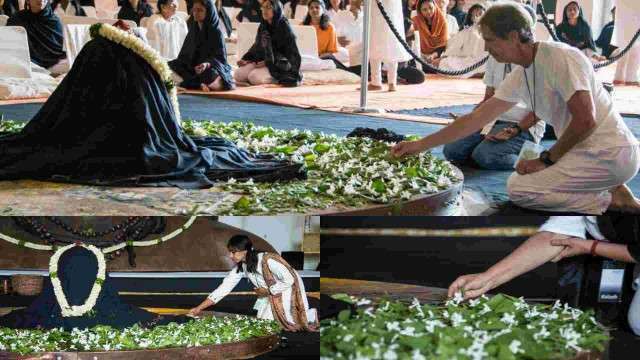 Sadhguru removes the garland from Adiyogi and offers the delicate flowers and leaves that the participants have been offering throughout the morning. A new garland is placed on the Adiyogi and an arati is offered, with Karpoora Gauram chanted. 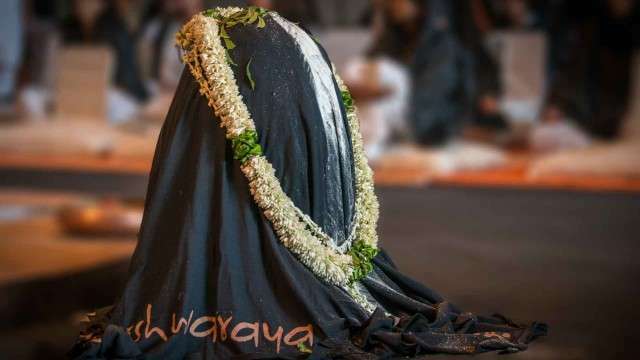 Sadhguru removes the black shawls placed yesterday on the linga and offers them to Adiyogi. As drumbeats continue, participants engage in a powerful meditation process. The linga is lifted. Sadhguru stops the drumbeats momentarily to announce, “The linga, the Adiyogi linga, will go into the garba now once and for all. 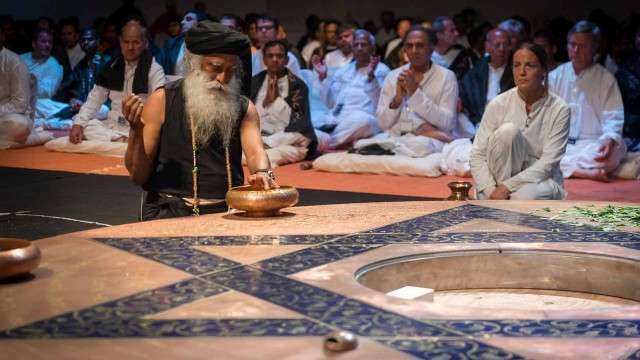 Keep your eyes open.” The linga is gently lowered by the gurney as Sadhguru places his hands on top, guiding its every move while chanting “Yoga Yoga Yogishwaraya”. All eyes and hearts are in the process. 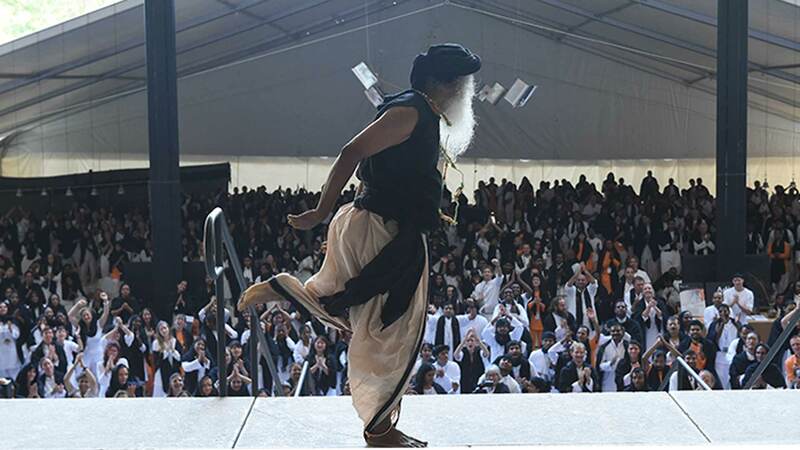 When the linga is finally in place, Sadhguru walks outside, into the view of the participants sitting in the tent, and everyone breaks into a celebration of clapping and dance. For over thirty minutes, Sadhguru and participants celebrate. Sadhguru offers water to the linga, and then invites participants – one by one – to come forward and offer water. Such a feeling of joy, celebration and love fills the room. The lower floor of the Abode has been designed to become a home for Linga Bhairavi. 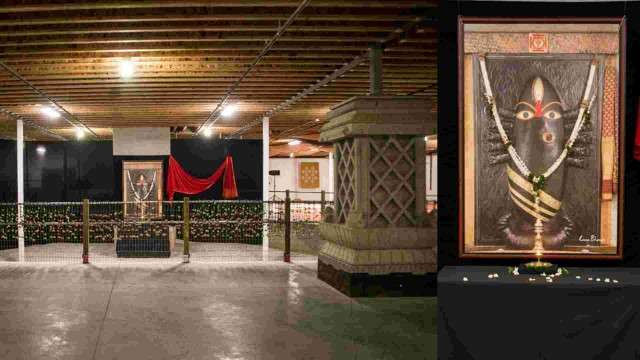 For now, Devi's photo has been placed within, flanked by a pair of intricately carved stone pillars. Visitors enjoying a sneak peek of the space express their excitement at the thought of soon experiencing Linga Bhairavi at iii. Stay tuned! A participant describes the atmosphere at iii, on the morning of the final day of the Consecration. "Serenity envelopes iii. The pleasant weather lingers on, and the scene is identical to yesterday’s, with hundreds of participants scattered on the green lawns soaking up the sun and embracing the energy which overflows from the Abode. Participants are coming in and out of Mahima - hundreds have had the opportunity to dwell in this magnificent space during their stay for the event. Though many, the movements of all, going about the business of getting ready for the day seem so harmonious as if all were one. 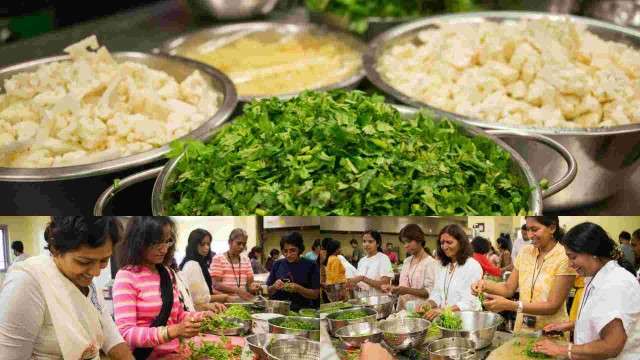 The scene at the kitchen is no different, though more activity is in full swing – the ongoing chant of “Brahmananda Swaroopa” seems to engulf all with inclusiveness. All seem happy and content, as if working together has fulfilled an unspoken longing for a deeper sense of connection with one other …Isha’s magic! Isha Shoppe has been like a busy beehive with hundreds of participants visiting during their breaks. The fleece, lightweight jackets have been a popular selection with a choice of white or Isha Orange colors, perfect for the cooler mornings and evenings of the plateau. Sadhguru’s books and CDs along with Sounds of Isha music are hard to keep on the shop’s shelves as they are the favorite pick. At nine o’clock, the Abode is opened to participants, giving them the opportunity to make an offering to Adiyogi. One by one they enter, bow and place their offering of green leaves on the five elements platform surrounding the linga. The energy in the Abode is a mixture of intensity and overflowing compassion, and Sadhguru’s presence is strongly felt. Adiyogi’s mesmerizing face draws one and all in more ways than can be comprehended , with many suddenly finding themselves unwilling to leave his sight for a moment. Participants linger and meditate while Sounds of Isha keep their enchanting music going. 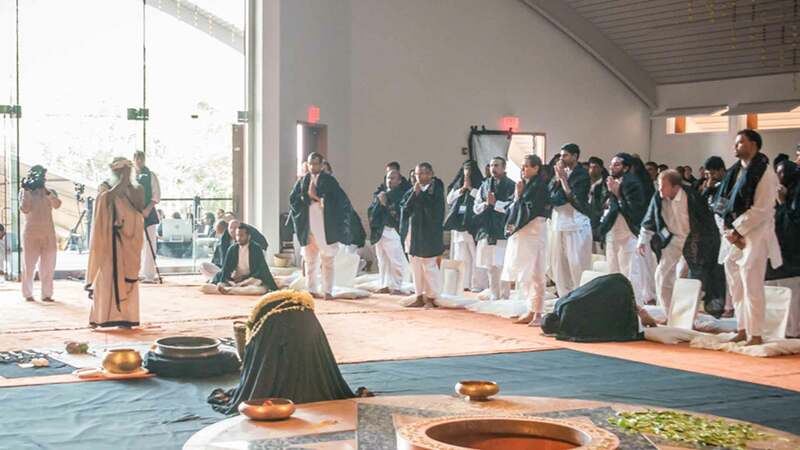 Another participant shared that, while at the Abode with Adiyogi’s presence, she felt that everything that Sadhguru has done in breaking her limitations ran in a moment through her, and she knew this was the crystallization of all that he poured into her. Clearly, Adiyogi’s presence is already touching lives in deep ways. The world will never be the same… a turning point in the history of humanity!" At 6:40 pm CST, the participants are arriving, wearing white clothing and a shawl with the inscription “Adi Yogishwaraya Namaha”. Sounds of Isha has been playing continuously for hours. All await the Master, some standing, some with folded hands, most clapping in joy. Sadhguru enters and unveils the linga amidst continued clapping and drum beats. He applies what looks like a powdered mixture to the linga, and then applies leaves. It is as if what Adiyogi did 15,000 years ago is being revived at this time and place. The same possibility for humanity is being made available here and now once again. Sadhguru sits on his seat, and the drumming and clapping ceases. The sound of violin takes its place along with the song “Baba jogi”. The flickering lamps behind the stillness of the yogi bring us into tears of gratitude towards the tremendous being amongst us and His endless offering of himself to humanity. He is pouring himself into the Adiyogi figure, infusing it with life. The yogi and the statue seem to merge and melt into one. It is as if what Adiyogi did 15,000 years ago is being revived at this time and place. The same possibility for humanity is being made available here and now once again. 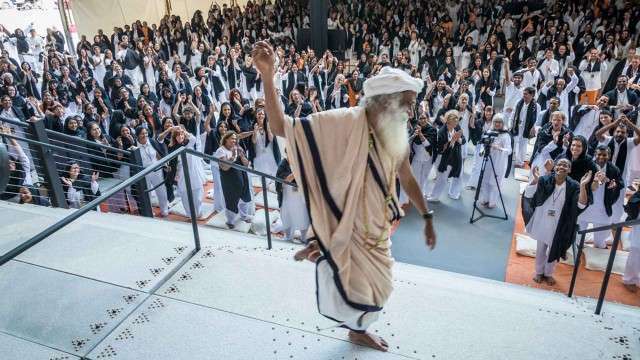 Sadhguru utters the “Yoga Yoga Yogishwaraya” chant. All repeat, and the chant continues on and on. Sadhguru goes outside for some time, then re-enters. 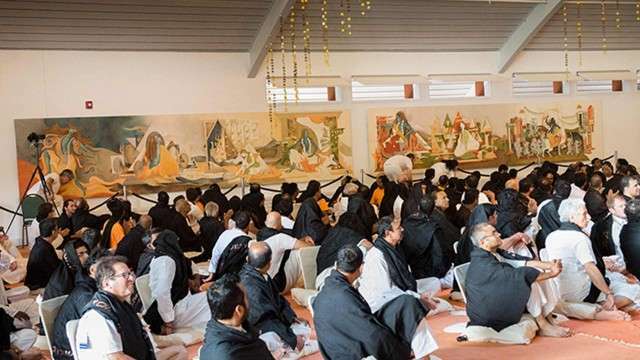 The image of Sadhguru Sri Brahma is visible at times, as if His wish to set the world alight with a spiritual fire is made a reality with this consecration. Sadhguru claps the familiar clap that offers life… the chant is on… more leaves are placed upon the linga. At 7:55 pm CST, the chanting stops. The linga is being lifted to its place. The Daridraya Dahana Stotram chant is heard. 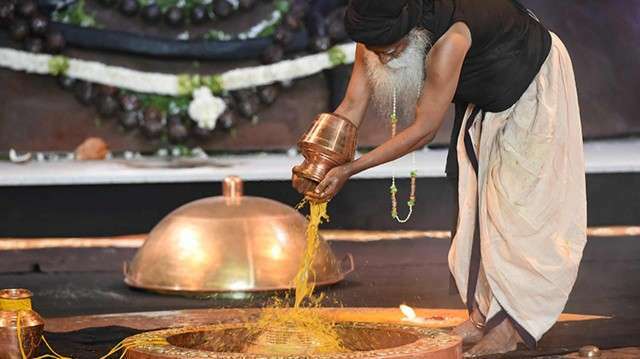 Sadhguru moves with the linga… slowly... slowly, until it is over its intended position. He is guiding its descent into its permanent place… the familiar clap. At 8:01 pm the linga is in place. A mantra process begins, and at 8:25 pm CST, the linga is totally revealed. Sadhguru applies several substances on it. The mantra process ends, and the Kalabhairavashtakam chant is heard. 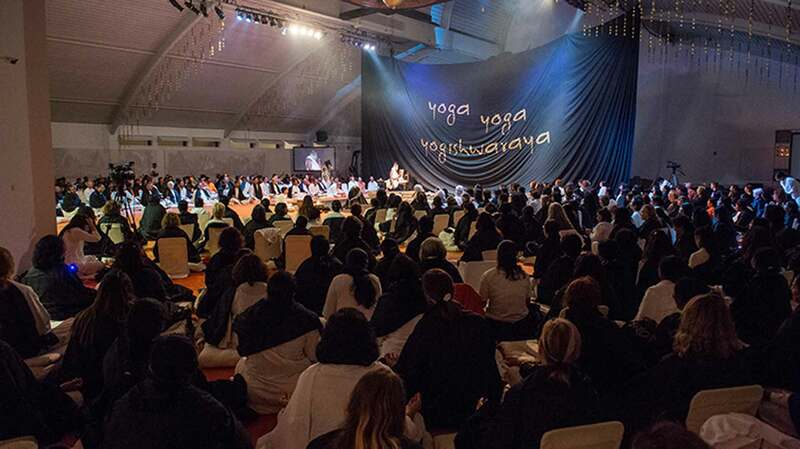 The consecration process continues as the participants chant “Yoga Yoga Yogishwaraya”. The base yantra which will be around the linga, he explains, also has the aspect of the 5 elements. 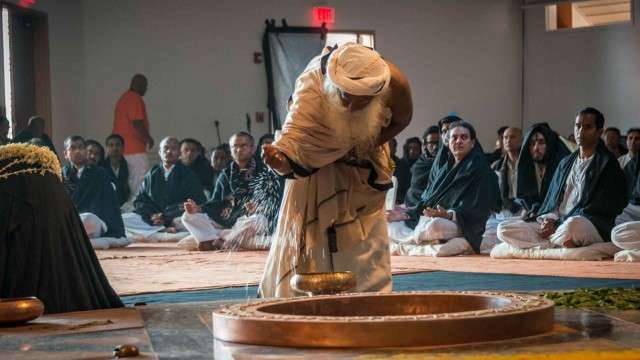 The linga will be largely submerged in water, he says, and when it is fully consecrated, you will have the opportunity to touch this wet linga and be able to imbibe and benefit from the energy that will radiate. The idea, says Sadhguru, is to place it in water so that it is more available to you. Traditionally, in India, only priests would have access to the lingas, but this is a powerful energy form that everyone will get to be in physical contact with. Dining for over 1700 participants, as well as the residents and volunteers, has been happening effortlessly. The iii dining hall, with its scenic view of the forest seen through the fully-glass wall on the northern side, has been decorated with banners placed in several spots, and every table is adorned with fresh flowers daily. At dinner time, an oil lamp is lit next to the flower arrangements. A few huge tents have been erected between the kitchen and the dining hall in order to comfortably seat everyone. This morning, as the weather has been perfect for the past few days, many are enjoying their meals sitting on the chairs scattered across the green lawn. Meals are savored by all, prepared twice daily by the center’s dedicated team of residents and volunteers from the busy hub of the kitchen. From early hours till midnight, those involved have been working tirelessly, pouring their love and life into making every meal as a prasadam for all. A participant shares: "It was breathless for me the moment I laid my eyes on the Adiyogi. During the mantra process, I tried to keep up with Sadhguru’s instructions, but at times I found myself forgetting to follow them, and instead I would be with his voice and chant just to listen and hear him. I have been to various temple consecrations, but what happened last night was different; it was very powerful! The way Sadhguru started the consecration, the powerful way he did it… I felt Adiyogi’s presence! When Sadhguru told us that we are here to be involved and to participate in the whole process, I felt very privileged to be doing this, and Sadhguru made it possible." A volunteer at the consecration describes how work has been going at rapid pace for many weeks. 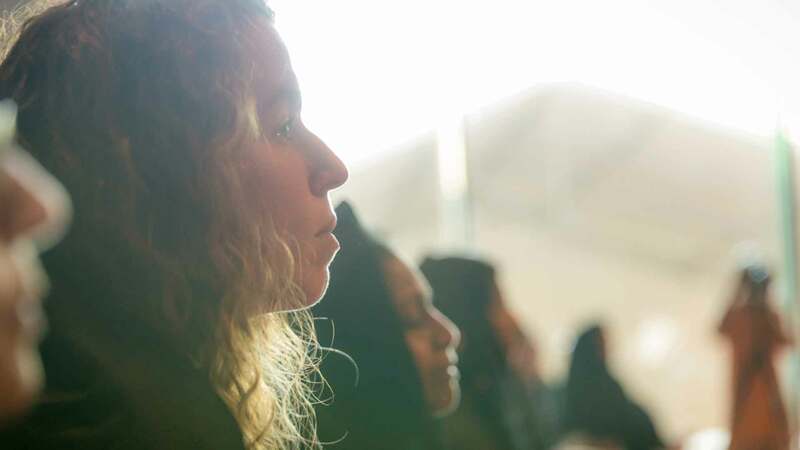 "For me, the biggest experience the last few weeks at iii has been so many situations when we think that things are going to fall apart, you stretch yourself, and at the last minute the support is just there, and it falls into place. For so many things, you wonder how we’re going to pull this through, and then it just happens. Even with the Adiyogi statue, until the day before the consecration, we were working day and night. When I saw the statue those weeks prior to the consecration, I didn’t quite understand what was the need to go in so much detail. What was it that was expected out of it, I just didn’t know, because I’m not a sculptor or an art person. To a layperson, it looked fine. But there was something that the team was looking for, with guidance of course, and something that they went on and on and on working for. 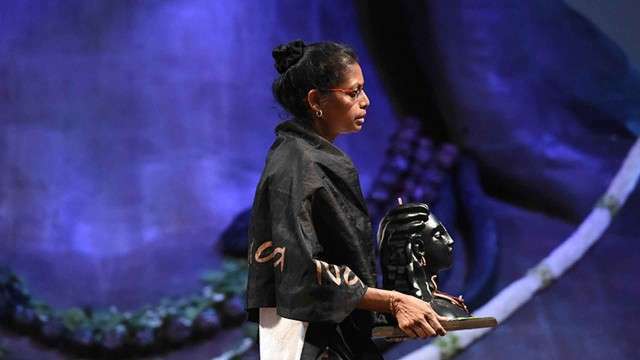 And finally when the statue was all set, the moment I looked at the Adiyogi, even to someone like me who knew nothing about it, it was like, “This is it.” That could evoke such a strong emotional response that was not there previously. It’s quite amazing. With what has happened with the statue, it's been transformed into almost like an "electro-presence" right now. And then the way the linga was brought in, the procession, and it was placed inside. It feels like it is a huge celebration. We are blessed, because what the space was before the Adiyogi and what it is now, just one day into the consecration, it’s tremendous. A kind of connection that I didn’t feel before, I can just feel it coming now, and it’s quite something. A questioner asks how this consecration is different from other consecrations. This Adiyogi is a combination of many things, Sadhguru explains, because we made a beautiful man. He is not purely aesthetic. He is a yogi, but with lots of accessories. This is how he came to his wedding. He has various aspects of life involved. It’s wrong to say this, Sadhguru adds, but for lack of vocabulary, I am saying this is a downgraded version of Dhyanalinga. 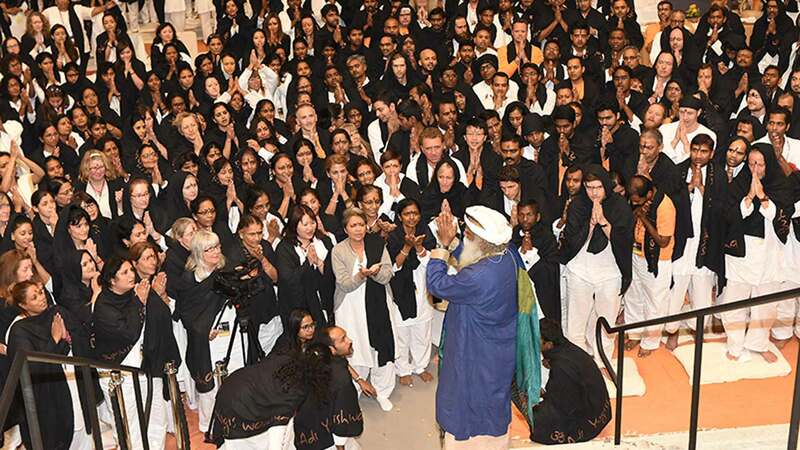 When the participants applaud, Sadhguru exclaims “I said downgraded!” It is a smaller version in a way because similar aspects are there, he continues, but not to the same extent. Generally, when you make a linga, there is no feminine at all, but he embodies the feminine in a certain way, so he’s both masculine and feminine. When Adigoyi started imparting his ways to the seven sages, Sadhguru recounts, he told Parvati to come sit on his lap. He pulled her closer, and after some time she became one half of him. If you want to include someone as part of you, Sadhguru adds, you have to throw out a part of yourself. Seeing this, the ganas said, “What about us?” Adiyogi said, “You just drink!” So, three forms of yoga were offered: one is delivering it as a pure science, as he delivered to the seven sages. Another is inclusion, which can only happen in a certain level of intimacy. Sadhguru notes that the word intimacy is contaminated in the Western part of the world - they think you went to bed. The fundamental energies, if they melt with each other, that is intimacy. So, the second way is absolute intimacy. With the third group, Adiyogi said, "You don’t bother, you just hang around." 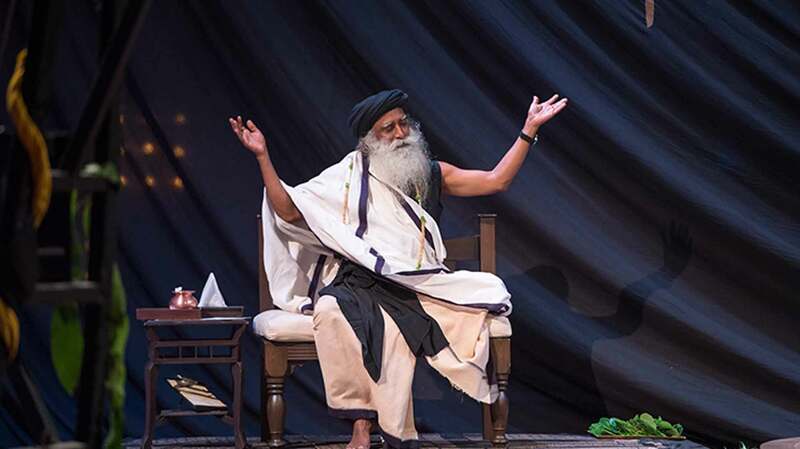 “I’m telling you the same thing,” Sadhguru says, and the participants break out in applause. A mala is then offered to Adiyogi, after which the afternoon session ends. Sadhguru then tells the story of Keertimukha, a demon created by Shiva to eat up someone who had been repeatedly bothering him too often. After seeing the demon, the person apologized, and Shiva told the demon to leave him. The demon then said, “The only purpose for which you created me is to eat him, what am I supposed to do now? I want to eat.” So Shiva replied, “You eat yourself.” The demon ate himself until the only things left were his arms, which were in his mouth. So, Sadhguru explains, Shiva bowed down to him, saying “You are a glorious face. You are above all gods” because if one knows how to eat himself up, if one knows how to obliterate himself, he’s above everyone. Because of this, there is no Indian temple without the face of Keertimukha. We just received him day before yesterday from India, Sadhguru says, and we are going to establish him above Adiyogi. Sadhguru then walks out of the Abode to the entrance. Music starts with powerful drum beats, and Sadhguru claps and dances as the excitement builds while the Keertimukha panel is installed. The crowd outside dances freely and claps to the drum beats. Sadhguru continues to dance, and people leave their seats to join in. The panel is installed in about 10 minutes, but the drums continue as Sadhguru re-enters the Abode. Day 2: Why This Face of the Adiyogi? As Sadhguru speaks about the Adiyogi, he begins to explain the colorful murals that are being installed along the walls of the Abode space. 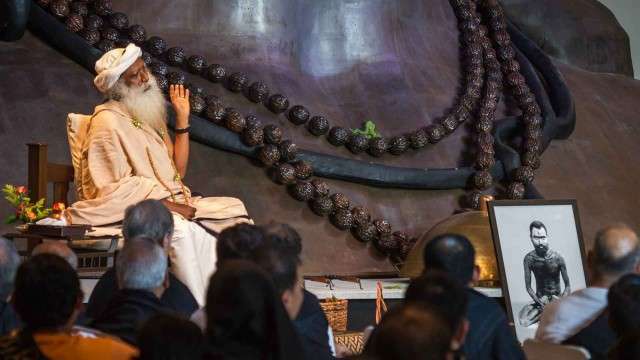 We are trying to depict Adiyogi’s life, Sadhguru says, him as a man, him as a Guru. These paintings have been worked on for about 5 months at the Isha Yoga Center, and were transported just before the Consecration event. Four panels have already come, and another 4 will be coming. Sadhguru then asks that the panels be unveiled so that participants can see them. Sadhguru elaborates on the depictions of Adiyogi, that Adiyogi made himself in such a way that people would be put off and nobody would bother him. So he generally wore an elephant hide; he slaughtered elephants to feed tribes and always wore fresh hide from elephants - still dripping with blood, so nobody comes near him. But it happened in such a way, Sadhguru continues, that he had to get married to a princess: Parvati, whose father was the king of the mountain tribes. Sadhguru describes the scene: Parvati said, "My groom Adiyogi is coming." Nobody had seen him except her. Everybody, including the royalty, was well-dressed and waiting. 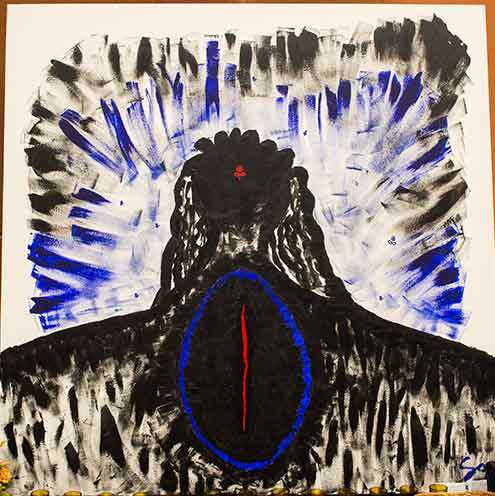 Adiyogi came wearing a freshly slaughtered elephant skin, dripping in blood, covered in ash from head to toe, dreadlocks, as fierce as anything can be. And he’s got weird friends, not in human form, making all kinds of noises, in a high state of intoxication, and he comes riding a bull. The mother of Parvati, Queen Meena, saw this man and said, “What? My daughter and him?” and she fainted. Then Parvati went to him and said, “I have no issues with you whichever way you are, but for my mother’s sake, take on the pleasant form. Or she won’t live through this wedding.” So, Sadhguru says, Adiyogi became like this, pointing to the Adiyogi statue. We thought, Sadhguru explains, when he’s coming to America we’ll bring him in this form. This form is called Sundaramurthy - his beautiful form. Sadhguru explains, there's a lot of debate about how a certain man looked thousands of years ago. For example, people keep questioning how Krishna could have been dark-skinned when he lived in North India. Thousands of years ago, whether a man had a nose or not, what’s your problem, Sadhguru asks. Whether he was handsome or not is a problem of that generation of women, not yours! They are relevant to us as a possibility that they offer to us, not as people, he explains. At noon, the Abode is already filled with participants awaiting Sadhguru’s arrival. Many have been sitting for hours to soak up the space as much as possible. Sounds of Isha begins the “Adiguruve” chant. On the screen, the meaning of the chant is written, which enumerates a few of Adiyogi’s many names. This chant refers to Adiyogi as thrayambakaya – the three-eyed one, referring to his perception that is beyond duality. As Sadhguru enters and sits, Sounds of Isha sings “Oru Murai”. A sense of love and stillness pervades the hall. Near Sadhguru’s seat, a picture of Sadhguru Sri Brahma rests directly in front of the Adiyogi statue. Sadhguru chants “Nada Brahma” and participants repeat after him. The powerful chant transports us into a different space. Sadhguru opens with a discourse on life and death. “The general perception of most human beings is that there is life and there is death,” he begins. People also believe there is day and night, he adds, but there is no such thing - there is just one day, and in that, there is light and darkness. Similarly, he says, there is no such thing as life and death; both are simultaneously happening right now. One who tries to reject death will only reject the life process. Sadhguru also says that the general perception in the world is that the basis of fear is death. But the basis of fear is life, Sadhguru continues, because what the mind fears is uncertainty: the intellect is always looking for certainty. But life is uncertainty, the only certainty is death. Coming to terms with life means not seeing life versus death, but that life is death and death is life - accepting death as a part of life. Sadhguru then speaks about Adiyogi and his work: Exploring the entire mechanics of what is human, how to make use of this in such a way that this does not turn into a problem, but becomes a possibility. "A possibility means something that is yet to happen. This means you must have the longing to step into the unknown,” Sadhguru explains. Sadhguru mentions the anniversary of his enlightenment. On this fateful day, 33 years ago, he recounts, "I happened to go up a small, graceful hill called Chamundi Hill, and never came down." "I went up as a very smart person - I was! At least I thought so", he adds. But when he went up the hill, that person just became a part of this magnificent phenomenon that you call as life and creation. 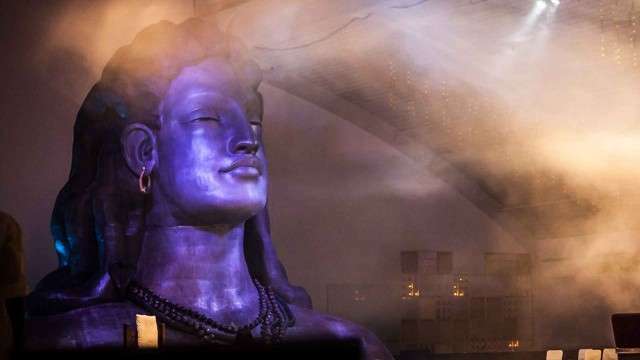 The Adiyogi statue, a focal point of the Abode, was created and first unveiled at the Isha Yoga Center in India on Guru Purnima in July 2014. 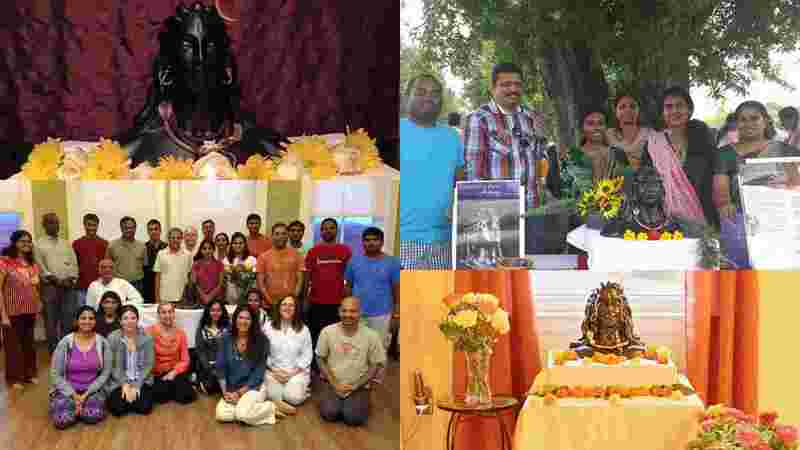 Coinciding with the events in India, a massive volunteer effort was set into place as volunteers in cities around the US banded together, hosting local Guru Purnima celebrations to raise awareness for the project. Following the unveiling, the statue began a long voyage over the oceans, arriving at a port on Georgia’s southern coast. 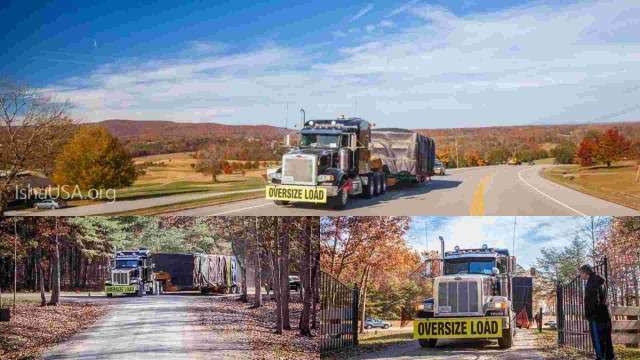 For the final leg of the journey, the statue traveled on 2 oversize trucks north through Georgia, with several Atlanta-based volunteers forming a caravan for the final stretch to iii in Tennessee. Upon arrival, the statue was secured into place atop a stacked arrangement of massive granite blocks, the base of which rests upon the bedrock of the Cumberland Plateau – a stable and lasting foundation for Adiyogi. The remaining construction of the Abode took place around the statue which waited, encased for protection, until it’s final unveiling. 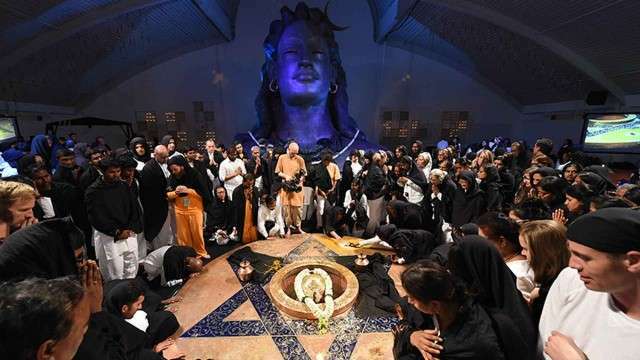 Meanwhile, over the last several months, consecrated 1 foot versions of the Adiyogi statue have been making their own journeys around the country. 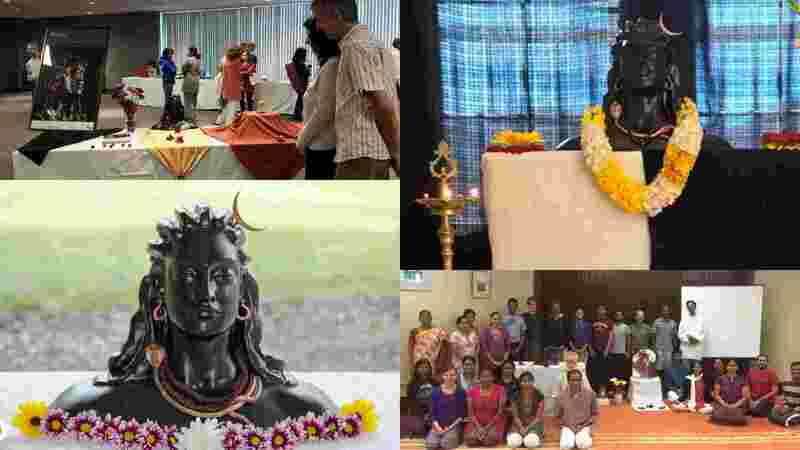 In cities and towns from coast to coast, volunteers have eagerly hosted the statues within their homes, even organizing events and opening up their homes for others to experience Adiyogi. The statues have also graced local monthly sathsangs in many cities, continuing to raise awareness and excitement about the project. These consecrated statues will now be available to individuals. Each statue is consecrated to create a certain reverberation in one’s home or office, serving as a powerful reminder of the higher possibilities within a human being and orienting oneself towards that goal. During the evening session, Sadhguru explains that the process will begin with Bhuta Shuddhi, the cleansing of the five elements, which is the most fundamental aspect of yoga. To do anything, he says, purification must be the first step. Sadhguru also speaks about the significance of geometry. The efficiency of any machine, he says, is a question of geometry. This also explains why Hatha Yoga is seen as the basic process to create the possibility of bigger dimensions in one’s life. Hatha Yoga, he explains, is about aligning the geometry of this individual body with the larger cosmic body, of which we are just a product. Today, modern science is also recognizing that what happens to the planet, happens to you. How well we are aligned will determine how much an individual human being can do in terms of various possibilities that one can explore. In building the Abode, a certain perfection of geometry has been involved. Two yantras have traveled all the way from India. The fundamental mantras concerned with the five elements - earth, water, fire, air and space - are written on one yantra, with the 6th segment representing AUM. As Sadhguru explains, AUM is the end of physicality, but there's nothing spiritual about it. When we say spiritual, Sadhguru says, to be technically correct it must be beyond physical nature. AUM is not beyond physical nature, but it takes you to the edge. Sounds of Isha then plays a new tune celebrating the Five Elements. Air – May the air remain agile, never be trapped in the ignorance of good and evil and allow them to touch all aspects of life and never be trapped with anything. Fire – May the fire of life burn intense and fierce enough to bake or mature these lives to make them fit to be rendered to the divine. Space – May this limitless space be not only like a mother’s lap but also a play ground to explore and experience life. May this infinite space always be a reminder not to be entrapped but use this relationship as a stepping stone to ultimate liberation. Earth – May the earth be firm and give health, wealth, prosperity and wellbeing. May they flourish in the lap of the Mother earth. Water – May the water remain pure and give vitality, balance, flexibility, take away the boundaries and like two rivers let them meet and mingle. At 10pm CST, Sadhguru unveils the Adiyogi statue. A participant shares, “I was stunned, looking at the image of Adiyogi. 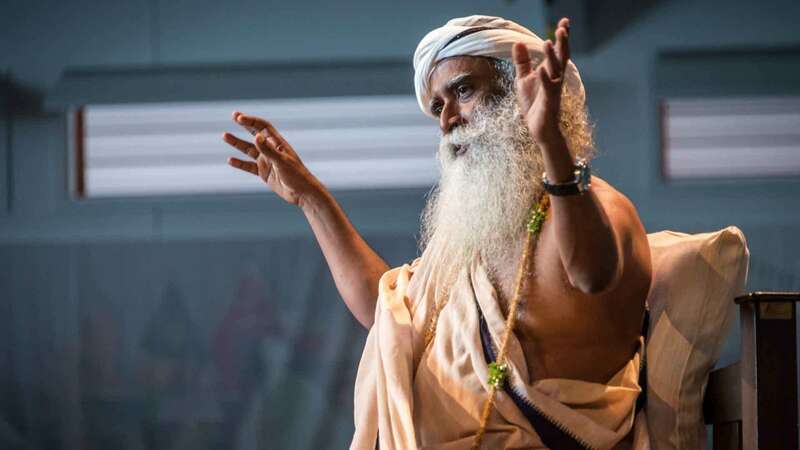 Sadhguru has been talking about this for so long, but to just have him appear like that made it so real, the immensity of what is being offered was so real, the idea of transformation is attainable. And the image is so beautiful, so stunning. I have never seen the Adiyogi portrayed like this.” Another participant shared that it seemed to “come alive” when the curtain fell. 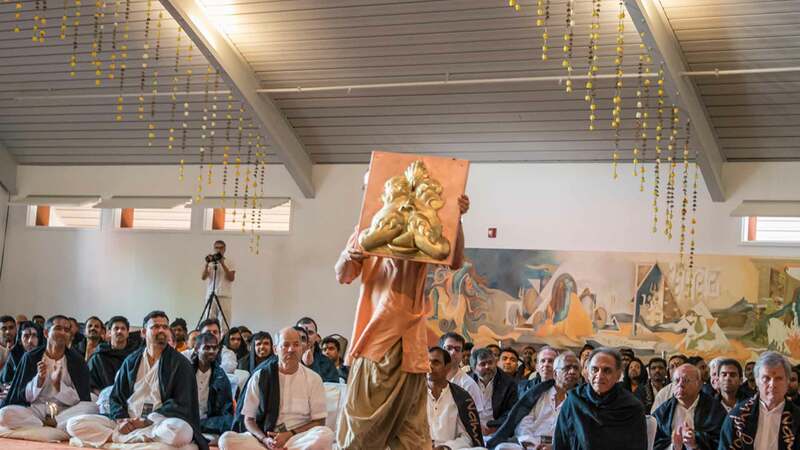 After the unveiling, a mantra is chanted to sensitize the space, and participants take part in a process to internalize one’s energy and to increase perception. At 12:15 am CST, Sadhguru asks the participants to continue chanting the mantra, and to come back at noon the next day. Day 1: First Session Begins - Why the Adiyogi? Sadhguru begins to speak about the significance of Adiyogi. He discusses the cyclical nature of life, and explains how Adiyogi offered a means to walk away from these cycles. Like this, Sadhguru says, the process of time is maintained in the body. It is only because of physical nature that there is time, and cyclical nature is the basis of all physicality. Everything is cyclical in nature. People realized this, and Adiyogi taught them how to get off the treadmill so that they would really go somewhere. Getting off the treadmill means one needs to be of a different level of energy. If you manage to pitch your energies to a certain level, Sadhguru explains, the potential of who you are is multifold - one life becomes 10 lives. What one can do in ten lifetimes, one can do in one lifetime. Adiyogi brought this dimension not as a philosophy or a teaching, but as a technology, as a method to do this in so many different ways. The very space one lives in can be energized in such a way that everything is enhanced. Sadhguru tells the participants that this is an opportunity to not just be a spectator, but to take part in the process, to be a part of creating the space. For these three days, he has designed it in such a way. Within the space of the Abode, intricate garlands of roses and copper flowers are strung by dozens of volunteers and hung from the ceiling of the majestic structure. Beautiful murals detailing the life of the Adi Yogi are hung to the walls. Last-minute construction details are tended to. For an onlooker the whole scene might look like total chaos, but within the chaos there is subtle organizational guidance with Isha’s signature of everything falling into place. 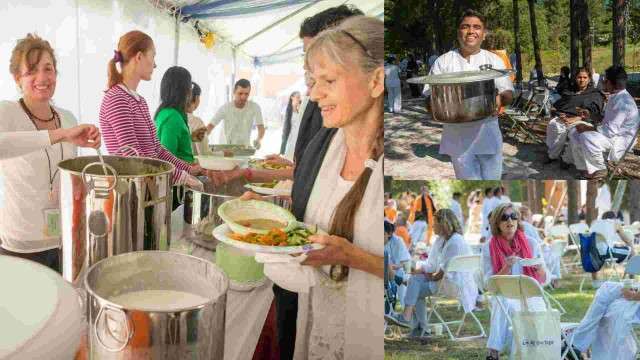 For iii, this will be the largest event to date, accommodating over 1,500 volunteers and participants, with volunteers tending to stay areas, dining, cooking meals, and so much more. 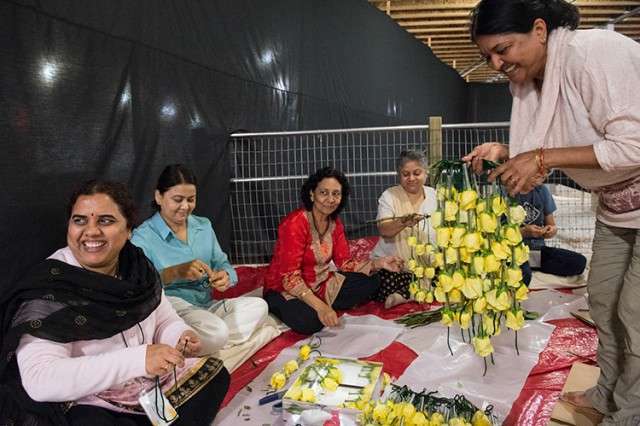 Various preparations happen effortlessly, as if one is infused with an unseen energy; even the physically challenging activities are transformed into a joyful experience, knowing that what is being done is an offering of love to Sadhguru. When will India be graced by the 112 ft Adiyogi Statues? There’s just two more nights to go till Mahashivarathri! Find out how you can join us on this night - one of the most powerful nights in the year.